Go for a relaxing glide on the Amish Yellow Pine Traditional English Glider Chair. This beautiful pine outdoor furniture offers comfort combined with attractive style to enhance your outdoor display. Perfect for your porch, patio or pool area, this custom made outdoor seating brings you outside for some fresh air and sunshine. With a well-built simple form, this English Glider Chair contributes to your family time with ease. Solid pine wood makes a great candidate for outdoor furniture that is quality at a great price. Bring home a set of English Gliders for yourself and someone you love! 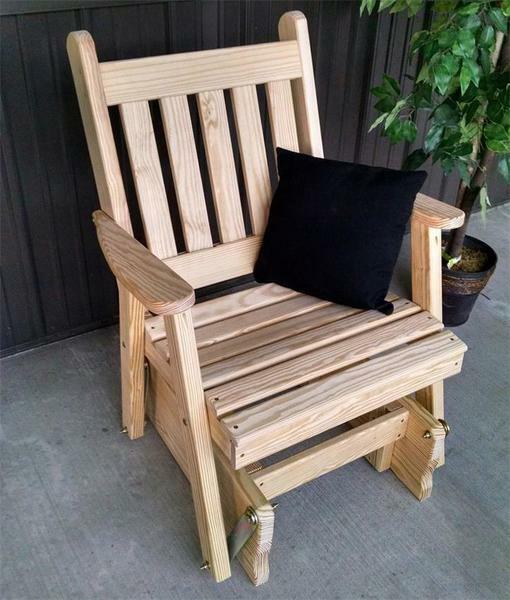 This pine glider is handcrafted for your home in Pennsylvania. Our talented Amish craftsmen use Untreated American Grown Knot Free Southern Yellow Pine wood and fashion it to be beautiful and durable. Select stain or paint for this wooden outdoor furniture. We are happy to send samples for you to work with while you decide. We're happy to provide customization options for your outdoor wood furniture. We can add cup holders to keep beverages conveniently nearby and we offer a fabulous collection of Sundown Fabrics if you'd like to add some accent pillows.